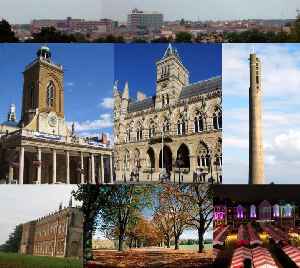 Northampton is the county town of Northamptonshire in the East Midlands of England. It lies on the River Nene, about 67 miles (108 km) north-west of London and 54 miles (87 km) south-east of Birmingham. It is one of the largest towns in the UK. Northampton had a population of 212,100 in the 2011 census.